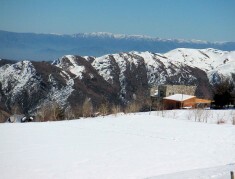 Located on a ridge at the southern edge of the village of Farellones, with panoramic views on three sides, Casa Farellones is five minutes walk on road or slide on skis from the ski lifts at Farellones (you can ski back) and five minutes drive from the ski base at La Parva or El Colorado (you can ski all the way back from here too). 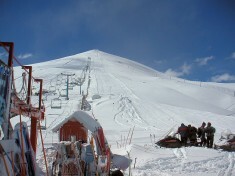 Valle Nevado (the third linked valley / resort in the area) is a 15 minute drive but can be accessed easily on skis from either El Colorado or La Parva ski areas (needs a multi resort pass). 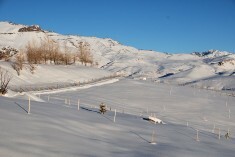 Skiing and boarding are the main winter activities. 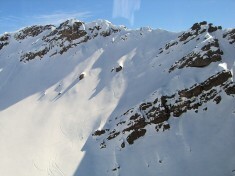 There is ample lift serviced terrain in the 3 resorts, but if you feel the need to venture further, Heli ski services are available from La Parva and Valle Nevado. In summer mountain walking, climbing or horse riding are available. We’ll be happy to provide further details and make the necessary arrangements. Unlike the ski base villages at La Parva and El Colorado, which empty out in the summer months, Farellones has many year round residents and the generally green and tree-filled gardens make it a pleasure to visit in the summer months.